Allonsfield House has an idyllic setting in a delightful part of the Suffolk countryside but is conveniently close to the towns of Woodbridge, Wickham Market, Framlingham and Saxmundham with fast access to other parts of East Anglia via the A12. Explore the services provided at Allonsfield, which are designed to make every resident’s stay a pleasant one. Set amongst the fields, streams and meadows of a delightful part of rural Suffolk, this beautiful old farmhouse consists of two parts. One is within the beautiful farmhouse that dates back to the 1600s, the second is located within the grounds; a purpose built building for those requiring dementia care. We have a wide variety of comfortable rooms including conservatories, lounges, dining rooms, patio areas and pleasant, interesting gardens to enjoy. There are also themed corridors and sensory areas that are designed to stimulate thought, conversation and action. Take a look at ‘Location and features’ and the 360o tour of the home to find out more. Here at Allonsfield and Ashefield we aim to create as homely an atmosphere as possible. We achieve this in many ways, but partly by ensuring that there are comfortable places to go for some quiet time, to listen to music or read a book. All the time you will feel supported, cared for and loved by friends and family. The home has resident pets and welcomes visiting family pets; this contributes to the homely feel. The residents are invited to join in the usual home-making tasks, such as dusting, sweeping, laying the tables, and arranging flowers, baking, gardening and painting. All residents also have an input into any proposed changes regarding the home, such as decoration, menu and pet additions. Allonsfield has a gorgeous original fireplace that we use on wintry days and this is a real pleasure for all. All residents are encouraged to furnish and decorate their rooms in the way they prefer, bringing in their precious pieces of furniture, photos and ornaments. The bedroom is a resident’s personal space and we want him or her to feel comfortable, at home and very happy in it. We hold a number of regular and not so regular events, such as summer fetes and BBQs, which many in the village take part in and enjoy. Our extensive, well-maintained garden with its koi pond is great to share with others. We are part of the local community and enjoy being involved in the church flower festival and the village fete. “I love this home and its beautiful surroundings. The care I receive is second to none and there is such a varied range of activities.” – Allonsfield resident. Residents can get up in the morning at whatever time they wish. There is a choice between a cooked or a cold breakfast. They can even take breakfast in bed if they like, but most enjoy using the communal, friendly dining rooms. Breakfast is followed by an optional programme of activities that include regular visits from the hairdresser, chiropodist and therapists; movement and music; singalongs, flower arranging, knitting, skittles, jigsaw puzzles, books and many other activities. There are organised and impromptu trips throughout the year including eating out, summer BBQs, themed events, as well as all the usual annual celebrations such as birthdays, Christmas and Easter. Alternatively residents can spend time with their family, relax in the lounge or conservatory or their room, watch TV, read a newspaper by the koi pond, play games, have one-to-one time with staff or chat with other residents – the choice is theirs. 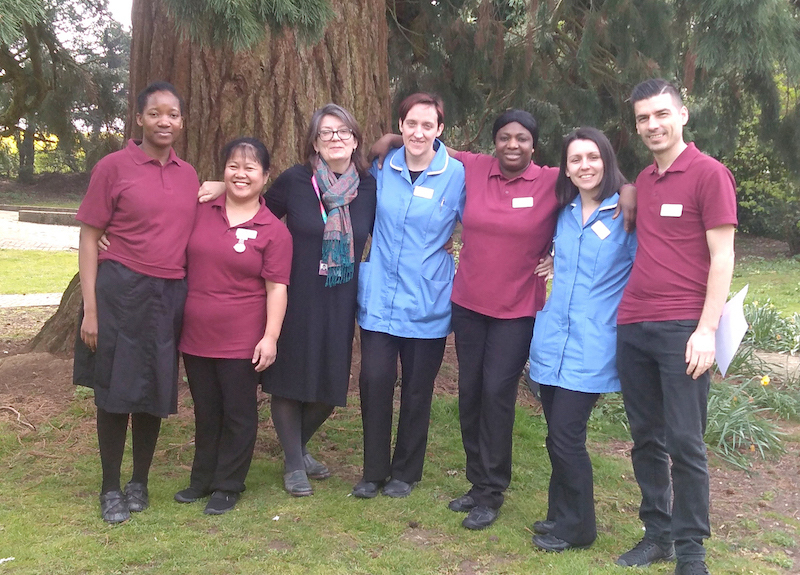 The committed, caring staff are on hand at all times, actively encouraging individuals to take part in the daily and extra activities that help to keep life fun and interesting. However, we never put people under pressure to join in. Staff members are encouraged to interact with the residents, while residents are encouraged to follow their own interests and make their own decisions. They may want to listen to their favourite music, have some ‘me time’ or share their experiences with others. We want them to relax and feel at home, without having to conform to set routines. Hot and cold drinks and snacks are served throughout the day. For lunch there is a choice of mains and desserts. Mealtimes are always sociable events, and our staff are great at getting even the quietest residents to be involved in activities and conversations but people do have the choice to eat in areas that are more private, with their visitors if they like. After supper, residents can opt to go to bed or to stay up until later relaxing in one of the communal areas or in their rooms. There are hot and cold drinks and alcohol is available. There is NO set bedtime; this is the home of the residents and they decide when they want to retire for the night. Here at Allonsfield we aim to make mealtimes relaxing and interesting. We always offer a choice, and the rotating menu consists of residents’ favourites. We do encourage all our residents to live as healthily as possible, so our cook ensures the meals are balanced and tasty. Kingsley Healthcare’s person centred approach to care creates a positive outlook and focuses on quality of life and relationships. We place great importance on the lives our residents have led, and spend time with them and family members to find out about their tastes, history, hobbies and interests. The information gained helps us to create individual care plans for each individual, which is paramount in providing the best care. In addition, it assists us in getting to know the individuals so that it becomes easier to build a positive relationship between staff and residents. Residents are always supported to achieve their aspirations and dreams by taking part in meetings, surveys and one-to-one sessions. We are committed to providing the best possible outcomes for people living with a dementia, and we achieve this through our ‘Wings’ (Welcome, Individuality, Nurturing, Guidance, Sensitivity) philosophy of care. Our bespoke learning programme is designed to ensure that a resident with a dementia is at the heart of everything we do. Both parts of the home are designed to be dementia friendly, and Ashefield was built to cater for those with a dementia. Our approach to care is appreciated by the residents who live with us, all of whom require residential or specialist dementia care. We choose employees that are kind and caring, skilled in engaging residents in meaningful activities and who fully understand the meaning of real person-centred care. They are committed to the home’s specialist training, which supports individuals to express their needs and in maintaining a high level of self-worth and well-being. The experience of individuals living here is that of love, achievement, well-being, encouragement and fulfilment. Each Kingsley care home is unique, but all have a set of highly respected and award-winning features, and the way we care for our residents makes a big difference in their lives. Our daily emphasis is on the care that is needed, whether it is physical, emotional, spiritual or mental. We also support our residents in maintaining their independence as much as possible, so we embrace and encourage ways in which they can do this. Family and friends are significant partners with the home (as with all Kingsley homes) and are welcome to come and go as they please throughout the day. We listen to the people who live with us and their families about the services we provide. “Thank you for your kindness and loving care given to our mum. Life has been hard for her but during her stay with you, no longer is she lonely.” – Kingsley resident’s relative. Allonsfield House and Ashefield is a pretty development in the heart of the village of Campsea Ashe. The home, set in an idyllic location, serves the wider community surrounding this picturesque rural area including Wickham Market, Tunstall, Woodbridge, Framlingham and Saxmundham. Allonsfield House is a converted farmhouse, dating from the 1600s, which has a truly homely feel. 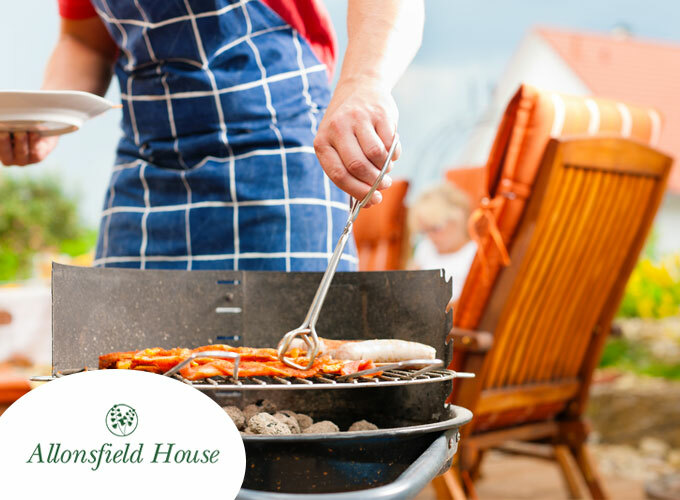 Ashefield is a bespoke build, tailored to the specialised needs of residents with memory loss and dementia. We actively encourage those who are considering living at Allonsfield House to visit and spend some time at the home to gain an accurate perception of the care we offer. It will give you an opportunity to meet the team and ask any questions you may have. Please feel free to look around at any time that is convenient to you. Staff are around at all times of the day and they will be happy to give you a guided tour of the premises and answer your questions. If you would like a discussion with the management, then a convenient appointment can be made. We pride ourselves on our attentive and enthusiastic team that works very well as a unit. The team is selected through a very thorough recruitment process, which reassures us that the staff are sincere in their caring attitude. Our new staff also complete a very intensive induction training program, where they are supported and helped to overcome any difficulties they might encounter. The team cares for our residents with the major emphasis being on quality of life, and we strive to give purpose to every single day for our residents. We work well with outside agencies here at Allonsfield, including the local GPs, district nurses and the health centre, in order to provide the residents with the best care possible. Come along to our Valentine's Day Coffee morning event. Thursday, February 14, 10.30am to noon. We actively encourage those who are considering living at Allonsfield to visit and spend some time at the home to gain an accurate perception of the care we offer. It will give you an opportunity to meet the team and ask any questions you may have. Please feel free to look around at any time that is convenient to you; staff are around at all times of the day and they will be happy to give you a guided tour of the premises and answer your questions. If you would like a discussion with the manager, Jill, then an appointment can easily be made. I would invite you to read our entire factual accuracy report when considering the CQC inspectors’ findings from their visit to Allonsfield. I make no excuses for the fact that is lengthy and detailed; our staff at Allonsfield were outraged and disappointed by the many inaccuracies in the CQC report. Please take the trouble to read our responses to obtain a more accurate impression of Allonsfield House. And we would invite you to visit Allonsfield House to make up your own minds and to look around our new luxury suites.